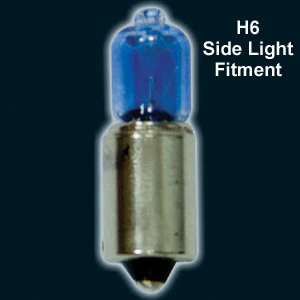 H6 Bayonet Fixing Xenon Gas Bulb. This versatile bulb can be used to upgrade many interior lights, sidelights and even some BMW "Angel Eye" light units to improve on the standard tired-looking yellow lights. They give a clean, powerful, white light. They use a combination of xenon gas and a blue quartz glass filter to block out the yellow elements of the output. Highly recommended. Price £4. 90 (+ VAT & P&P).